Chennai Metro Rail Limited Recruitment 2017: Chennai Metro Rail Limited company has announced its recent Job Vacancy 2017 2018 for 04 Assistant Manager, Deputy Manager, Architect Posts. Here you will get Application Form and notification details. 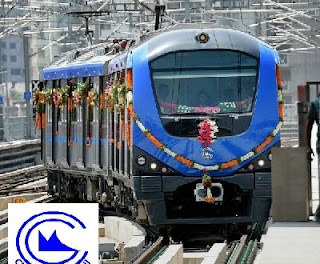 Want to know more details such as CMRL Syllabus, Call Latter, Age Limit, Eligibility Criteria, Application Processes, CMRL Walk in Date, CMRL Result Date Details. Now here you can check it below. The Chennai Metro, officially Chennai Metro Rail Limited (CMRL), is a rapid transit system serving the city of Chennai, Tamil Nadu, India. The system commenced revenue service in 2015 after partially opening the first phase of the project. The network consists of two colour-coded lines covering a length of 54.1 kilometres (33.6 mi). Upon completion Chennai Metro will be one of the largest metro system in India along with Delhi Metro, Namma Metro and Kolkata Metro. The Chennai Metro Rail Limited (CMRL), a joint venture between Government of India and the Government of Tamil Nadu builds and operates Chennai Metro. The system has a mix of underground and elevated stations and uses standard gauge. The services operate daily between 06:00 and 22:00 with a varying-frequency of 10-20 minutes. B.E/B.Tech in Civil/Environment with minimum 60% of marks. Check more graduation details on the notification. Maximum age limit range: (For Post 1 - 35 Years), (For Post 2, 3 - 30 Years). Candidates Relaxation in Upper Age limit will be provided as per Govt. Rules. interview followed by Medical examination. The selection process would judge different facets of knowledge, skills, comprehension, aptitude and physical fitness. Check more details on notification.